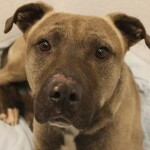 You are here: Home / Shelters & Rescue / Sweet Walter – Older Male Seeks Cuddles – Adopted! Sweet Walter – Older Male Seeks Cuddles – Adopted! I fell in love with Walter the moment I saw him – what’s not to love about that smile? He’s a sweet older gentleman whose looking for a daily walk and some nice cuddles. Walter was left behind when his previous owners moved. He ended up in the care of the Almost Home Animal Rescue League in Southfield, Michigan where he’s currently being fostered. He loves daily walks, giving kisses, and adores cuddling. He’s a happy go lucky kind of guy – perfect for anyone looking for a laid back best friend. He’s approximately 11 years old and 46 pounds. Walter gets along calm children, cats, and dogs but he can get a bit overexcited when meeting some canines so introductions to any existing dogs is a must. He’s current on his vaccines and neutered. If you’re looking for a very sweet and loving companion Walter is your guy – he’s available for adoption now and just waiting to find his forever home. I am rather calm and spend the majority of my time sleeping, but I will happily get up to go for a walk or give kisses to anyone who’d like some. I walk pretty good on a leash and am a well mannered boy. I love to snuggle up in blankets and have a quirky habit of burying my food and treats in them; I like to store them for later! Though my face is getting grey, my fur is still a lovely shade of brown and is actually very soft. Despite all that I’ve been through, I am still such a loving, happy guy. I guess this makes me living proof that older dogs are the best kinds of dogs! I am now looking for a family to spend my golden years with. I am already neutered and have been brought up to date on my vaccinations. I would do fine in a home with gentle children or cats, and I enjoy the company of other dogs. However, I sometimes get a little over-excited in the company of other canines and may need to meet my new four-legged family member before committing to your home. I will bark to let you know when it’s time to go outside and have some time left that I would love to spend with you. 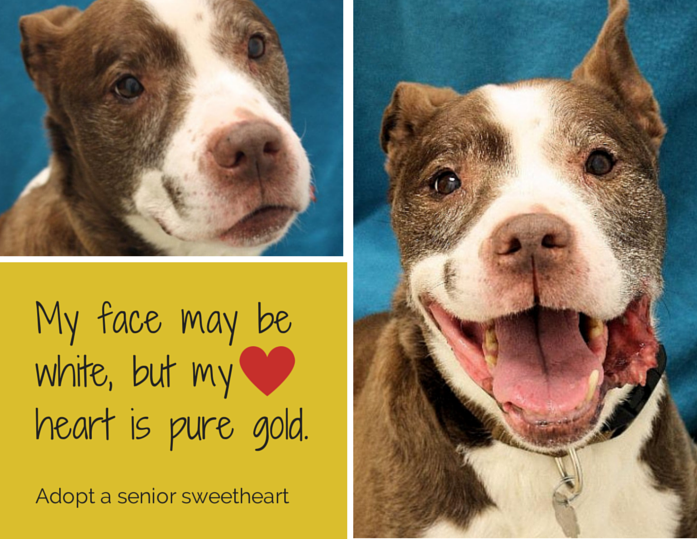 November is adopt a senior dog month; let’s honor these older sweethearts and find them the loving homes they deserve. What benefits do you find in adopting senior pets? Did I miss any great posts or articles I should include? Do you have any tips on how we can increase adoptions for seniors? I’d love to hear your thoughts and ideas in the comments below. 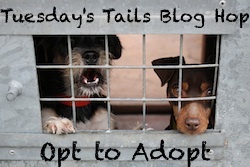 We’re joining the Tuesday’s Tails Blog Hop. The Tuesday’s Tails is hosted by Talking Dogs and Dogs N Pawz. 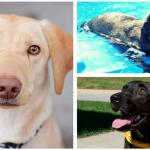 This is the weekly blog hop that features adoptable shelter pets. Join in on the hop or help spread the word by sharing these lovely pets and helping them find the forever homes they deserve. 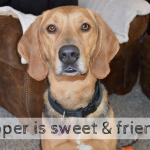 Cooper is seeking a new home in Michigan – Adopted! Oh my gosh. That Walter is so adorable. I sure hope he gets into his forever home soon. I have such a soft spot for the seniors. 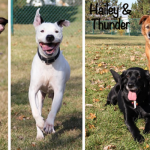 Thanks for spreading the word about the benefits of adopting an older dog, and thank you for sharing my post and the others too! Walter looks super happy! Thanks for continuing to spread the word about benefits of adopting senior dogs. 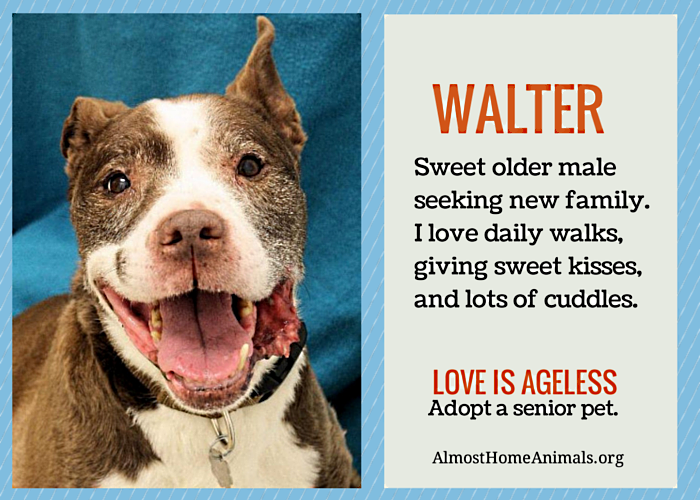 Walter is one handsome senior guy! Paws crossed this boy finds a new home soon! Sharing.